Italy is a country, able to meet the highest demands in terms of leisure tourism. Convenient location in the Central Mediterranean, the rich heritage of great civilizations, a variety of natural landscapes make a memorable holiday in Italy. high level of hotel service. Italy is located in the Apennine peninsula and washed by the seas, which are part of the Mediterranean. However, a substantial length of the peninsula, and the differences in terrain have a significant impact on the climatic characteristics in different regions of the country, that must be considered when planning a holiday in Italy. In northern Italy the climate is temperate continental with hot summers and cool, raw winter, when the temperature goes down to +4 – +6 degrees. In July, the warmest month, night temperatures are +20, a day to climb 30 degrees. In the mountains, snow is six months, so that the ski season lasts from October to May. Often, in the mountains the temperature drops to -15-20 degrees. At the same time the Alps protect the country from the colder northern winds. In the central part of the peninsula there is a temperate climate, and at the seaside - subtropical, comfortable for a beach holiday in Italy. On the Ligurian Riviera is dominated by south-westerly winds, long hot summers with an average July temperature +25 degrees. winter warm, the average temperature in the south in the winter +10. The structure of Italy includes several large and many small islands of the Mediterranean Sea. They are dominated by a Mediterranean climate with little winter rainfall. 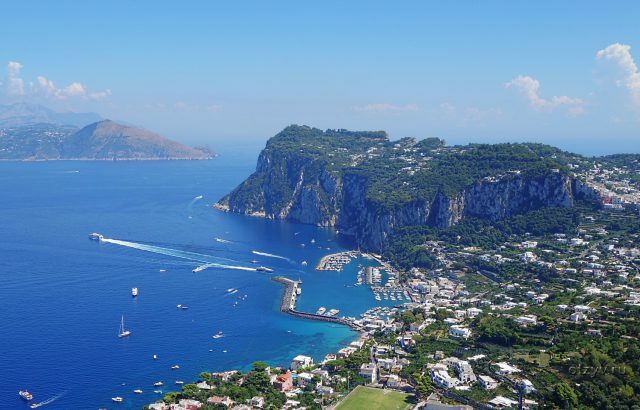 for example, Capri and Sicily average winter temperatures do not fall below +15 – +17 degrees. Particularly comfortable for holidays in Italy Ischia, where hot mineral springs have contributed to the warmer climate. A characteristic feature of the local climate is a sirocco - hot and humid wind, often blowing from North Africa. The peninsula is washed by five seas, thanks to which Italy has one of the longest coastlines - up 7600 km. The best beach resorts with sandy and pebble beaches, ready to offer its guests a variety of water recreation in Italy, designed for any category of tourists. Adriatic resort area is one of the best regions of Italy for a beach holiday. Longest coastline with white sand beaches and rich marine life attracts a well-developed infrastructure and comfortable prices. Among the leading Adriatic resorts Rimini. Rimini - a small coastal town in Italy, popular for youth recreation. The beach season begins in May and lasts until September, with the largest influx in July-August. Excellent beaches with fine sand, warm sea with a gentle sunset attractive for families with young children. On the waterfront dive centers operate, there are sports fields and tennis courts, organized entertainment for children. Holidays in Italy in the resort of Rimini is complete without interesting excursions. The antiquity of the town testify to the architectural sights, part of which belongs to the ancient period. Among them - the Arch of Augustus, which is the oldest in the Italian design of this type. It was built in 1 century in honor of Octavian Augustus and crowned with four horses, an emperor. In the Middle Ages, the arch has become a part of the fortress wall, and today - a popular tourist attraction, come to stay in Italy. Rimini has become a symbol of the famous Bridge of Tiberius, built in 1 century. For two millennia, he suffered a lot of floods and earthquakes. It could destroy the only Gothic invasion troops, after which the bridge has been restored and is still in use. It is associated with various legends, Many call it the Devil's Bridge, counting, he could survive only with the help of "dark forces". But most of all Tiberius Bridge, known for, that in this place the famous Caesar took the decision to move the Rubicon. 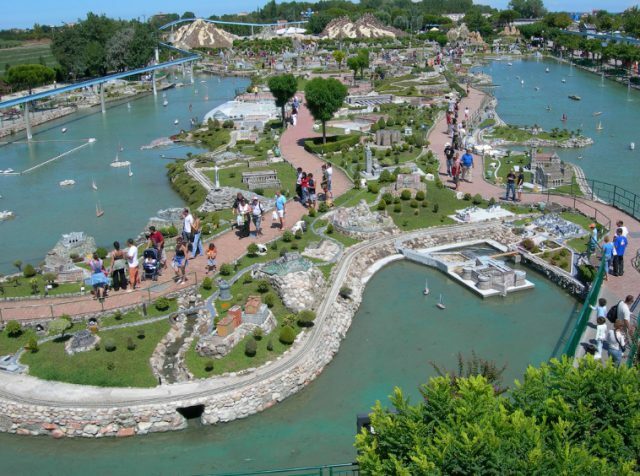 Guests Rimini awaits gay vacation in the park "Italy in Miniature", where they will see a small copy of the country's and the world's most famous landmarks. The park is open from 1970 year and is considered the oldest in Italy. In the park you can take a ride on the mini train, considering the greatest architectural creations, the scaled 1:25 or 1:50. Among them is the area of ​​a miniature Venice, which is just the scale 1:5. Visitors can take a boat ride past the magnificent palaces of the Grand Canal. The choice of Rimini for holidays in Italy and attracts gay, colorful festivals, the most popular of them is the summer festival "Pink Night". City at this time transformed, building decorated with roses alive, Street flooding magic lights. Residents wear suits rich pink tones and put on face bright make-up. Funky disco on the beaches continues all night. Every year the festival is visited by an increasing number of participants. Rimini hotel is designed for the different categories of tourists, from newlyweds, selected as the honeymoon vacation in Italy, to families with children, arrived to spend a holiday by the sea. Most of the hotels located on the coast. They are characterized by a seasonal operation - from May to October. Located in a historic building in the center of the promenade of Rimini. The interiors of the luxurious suites feature elegant sophistication and wealth. Pastel colors decoration is skillfully combined with rich fabrics and carpets. Rooms are decorated with beautiful carved wooden furniture. At various times in the Grand Hotel Rimini e Residenza Parco Fellini in Italy, many celebrities rest, among them Caruso and Mussolini, Gorbachev and Princess Diana. French Windows open onto a balcony, where you can admire the magnificent panorama of snow-white sailboats, swaying in the blue waves. A two minute walk from a private beach. Guests have access to swimming pools, sports complex, SPA-center, located in the park zone extensive, Ambient hotel. On summer vacation in Italy, you can save, rent a villa on the Adriatic coast. Villa Villetta Orchidea is intended for a relaxing family holiday with children. It offers cozy, beautifully furnished apartments with all the amenities. The house has a kitchen with all accessories, which has access to the yard. The beach is a few minutes walk, Nearby is a water park. Ligurian Sea is a place of luxury holidays in Italy. Gracefully curved line of the Gulf of Genoa is famous for its incredibly beautiful scenery, which form a pictorial village, perched on mountainsides, and enchanting coves with sandy beaches. Alpine Mountain shelter the coast from the north winds, and the heat protecting sea winds. Along the coast stretches a chain of popular resorts, and in the center of the bay is the capital of Liguria - Genoa magnificent. Ligurian coast is one of the best holiday destinations in Italy. This attractive historical sites, picturesque scenery and beautiful beaches. The cozy seaside towns are surrounded by greenery, and the waterfront views of the beautiful azure sea and the mountains. Each one is unique in its own way and is able to offer an interesting excursion rest. San Remo is known for an annual festival song, and 19 century it was a popular holiday destination in Italy, the royal families of Europe. Many Russian aristocratic families owned real estate here, too. Around that time, and was built in San Remo Russian church. Five-domed church of red brick-domed cupolas in the style of Moscow churches 16 century and is decorated with elaborate stone carvings. Roofs and domes decorated with colored tiles, and the octagonal bell tower is lined with majolica. A few steps from the church shines the splendor of an elegant building of the casino - a favorite vacation spot in Italy, many well-known personalities. Unique architecture mansions attracts Genoa. Mesmerizing atmosphere of medieval streets and beautiful palaces, old square and majestic cathedrals. From the coastal hills above the city crenellated tower Albertis Castle. With its height offers a magnificent view of the bay. The castle today houses the Museum of World Cultures, basis for the collection of which served as souvenirs of his former owner, which he brought from his travels. Spend a comfortable holiday in Italy, offers hotels of various levels. For those, who came to get acquainted with the historical monuments Italy, excellent option will be the city hotels or hostels, which many in Genoa. Fans of sunbathing and swimming is better to choose the hotel in one of the resort towns. Most of them have their own territory, overlooking the sea, and well-developed beach infrastructure. 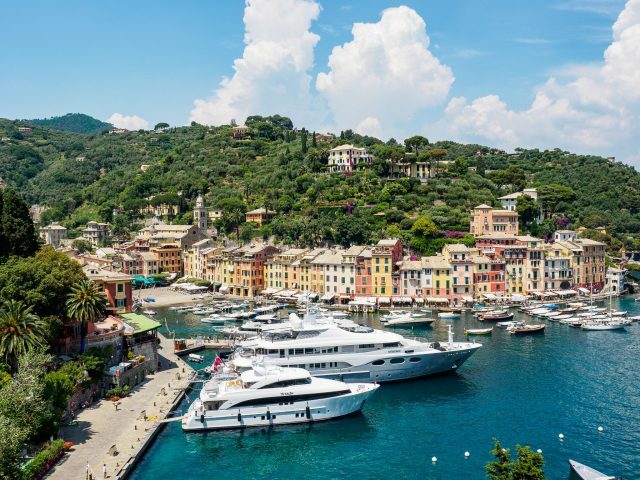 Best holiday in Italy promises Belmond Hotel Splendido, which is located on a beautiful hillside, Just above the harbor of Portofino. Guests will be convenient spacious apartments, overlooking the wide furnished terrace. It is possible to sunbathe, enjoying the magnificent views of the surrounding area and a charming garden with a swimming pool. The rooms and the terrace a lot of fresh flowers, which adds the comfort of home in an elegant atmosphere. The hotel features a wellness center and opportunities for sports, which will make holidays in Italy interesting and varied. The hotel is surrounded by wonderful landscaped gardens with winding paths and colorful flowerbeds fragrant. shady alley, lined tall palms, It goes straight to the beach with comfortable entering the sea. Cozy rooms equipped with modern amenities, and a balcony with beautiful views. A wellness center with massage and sauna. Holidays in Italy, on the shore of the Tyrrhenian Sea, especially popular among the people of Europe. Thyrrenic Sea represents a huge basin deeper than 3700 m, formed as a result of tectonic shifts of the Earth's crust. On a seismic fault, passing under the sea, is volcanic chain, some of whom are active. for example, on the island of Stromboli earthquakes of varying strength occur nearly every day. 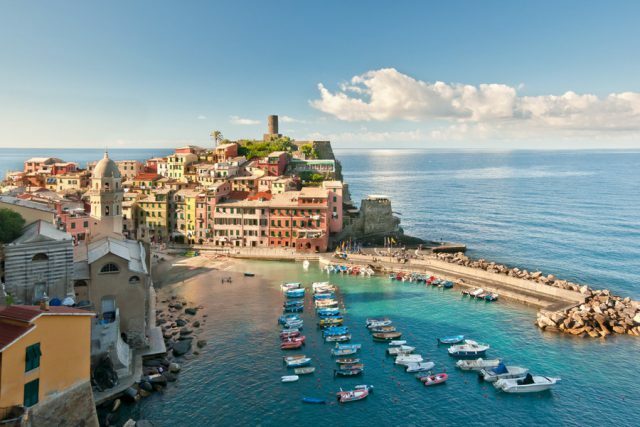 Holidays in Italy, on the coast of the Tyrrhenian Sea, It attracts comfortable climate, well-developed infrastructure and proximity to the ancient cities of Italy, with popular attractions. However, on the coast there are plenty of interesting places. The main town on the coast - Naples, Located at the foot of the legendary Mount Vesuvius. Visiting Naples attractions will be an excellent complement to the beach holiday in Italy. On the shores of the Bay of Naples stands the massive Castel Nuovo. It is a large fortress with crenellated corner towers. Its history is rich with various events. The castle was built in the late 13 century at the behest of King Charles of Anjou. However, he did not have time to move into the new residence for conspiracy, which is known in history, how Sitsiliyskaya Vespers. In the future, the castle withstood sieges and military, and during a major earthquake. Today he is one of the best architectural monuments of the Middle Ages, mandatory to visit during your holiday in Italy. One of the best resorts of the coast is the city of Tirrenia. He is famous for its beautiful sandy beaches and high-class hotel complexes. Tirrenia neighborhood are part of a unique wildlife reserve. It laid out interesting routes for hiking and horseback tours. Near the beaches there are sports centers, where you can enjoy a variety of sports activities for adults and children. Hotels of different categories equipped with all facilities for families with children in Italy. Comfortable family rooms, equipped with all amenities, It offers Grand Hotel Golf 4*. The advantage of the hotel is its proximity to the sea, which is just a short walk. Apartments include a private kitchen and a balcony overlooking the sea. It surrounded by a beautiful garden with an outdoor swimming pool and tennis court. Nearby there is a golf course. A wonderful holiday on the coast of Italy will provide the Beverly Park Hotel Residence. Family apartments are located in a three-minute walk from the sandy beach with a gentle entry into the sea. Comfortably furnished rooms with a spacious seating area are additionally equipped with a kitchenette. On the territory of a small garden laid out, an outdoor swimming pool and children's playground. Bike rentals, next to a park with a bicycle lane. In the southern part of the Gulf of Naples is located a tiny island, which has become a symbol of luxury holiday in Italy. Despite the small area, on the island is something to see - bizarre rocks, sea ​​caves, magnificent villas. But its main advantage are considered unique landscapes and quiet little bays. Island resorts there are more than fifty hotels of different class, but they are all characterized by a high level of service and wide recreation opportunities. One of the best hotels in Italy for your holiday in Capri. It is located in a historic building of the last century, which preserved elements of the original decor. interiors, with a contemporary design solutions, represent an exquisite mix of styles. Apartment with a furnished terrace and sea view located in a lush garden. The hotel area goes to the beach with wide stone terraces. An outdoor pool and spa with a wide range of services. The best conditions for seaside holidays in Italy with children offers boutique hotel Capri Palace. It offers luxurious apartments with a refined interior, special elegance infused snow-white furniture and rich fabrics. Spacious terraces overlook the beautiful garden, to the pool. The spa can be passed complex anti-aging treatments. The hotel has its own wine cellar with regular wine tasting and yachts for walking. For children organized special entertainment programs. Ionian Coast connoisseurs choose a quiet secluded vacation in Italy. Coastal waters are famous for abundant wildlife, and small islands - pristine nature. There are no noisy entertainment, but a lot of historical and architectural monuments, who left the eventful history. A wide clean beaches with soft sand, shallow sea near the coast with easy calling and excellent infrastructure make attractive family vacation in Italy with young children. Resorts of the Ionian coast of Italy has an interesting sightseeing vacation, due to the abundance of medieval monuments and castles, scattered around. One of them is located in the popular resort town of Calabria Rocca Imperiale. Castle 13 century, Built on a cliff top, served a defensive function. Today from it are preserved fragments of walls and bridges, but under reconstruction. Holidays in Italy, the resort Rocca Imperiale, interesting and famous festival of lemons, which takes place every summer. lemons grown here is exported all over the country. During the festival the city hosts theatrical performances in the spirit of the Middle Ages. On the shelves exhibited products from lemon - jams, copper, liqueurs and tinctures. But particularly attractive beautiful beaches Rocca Imperiale, which stretch along the coast for several kilometers. Hotel base for a holiday in Italy, on the Ionian coast is presented hotels of different categories - from large hotel complexes with an extensive infrastructure to small cozy villas and holiday homes, offering self-catering apartments. They are more convenient for families with children. Cozy country-style apartments are located near the sea. The hotel is situated in the countryside, away from city noise. Here you can enjoy a peaceful holiday by the sea in Italy in peace and quiet, admiring the stunning views of the surrounding area. Rooms are furnished with elegant simplicity, each of them has a separate entrance to the picturesque garden. For those wishing to organize trips to the hiking and cycling route. Classes on horse-riding. In a quiet cozy little cove is a magnificent hotel complex with comfortable apartments, decorated with warm, pastel colors. Spacious terraces overlook the lush garden with a large swimming pool. for families, Hotels in Italy with children, the hotel offers the greatest opportunity. They can relax in the children's playground and a water park, Located on its own territory. Works and children's animation. To the white sandy beach is shaded alley, can be reached, and a special small train. Fans of water entertainment can choose sailing courses or water skiing. Many believe the best place for holidays in Italy Amalfi Coast, extending along the shores of the Gulf of Salerno. The mountains, slopes are covered with citrus orchards, tiny picturesque villages, buried in the greenery, winding streets, leading to transparent clear sea, create unique landscapes, forever endearing hearts. seaside towns, scattered along the coast, is a charming complement the surrounding landscape. They preserved ancient cathedrals and villas, attracts lovers of sightseeing holiday in Italy. The main attraction of the town of Amalfi is the Cathedral of St. Andrew, architectural monument 11 century. The original building was built in the Byzantine style, and later underwent renovation, in which the elements appear graceful Gothic and baroque lush in its architecture. However, a mixture of styles does not spoil its appearance, and add even more charm. Cathedral is popular not only for tourists, are on holiday in Italy. It is visited by many pilgrims, who came to worship the holy relics, which are stored in its crypt. It attracts the attention of the main facade of the building, marble mosaic. Open arches are decorated with carved stone. Inside the temple are massive bronze doors. On the structure of adjacent four turrets, lined with majolica. Amalfi Hotels presented as modern buildings, form the largest hotel complexes, and ancient buildings, apartments differ royal luxury. 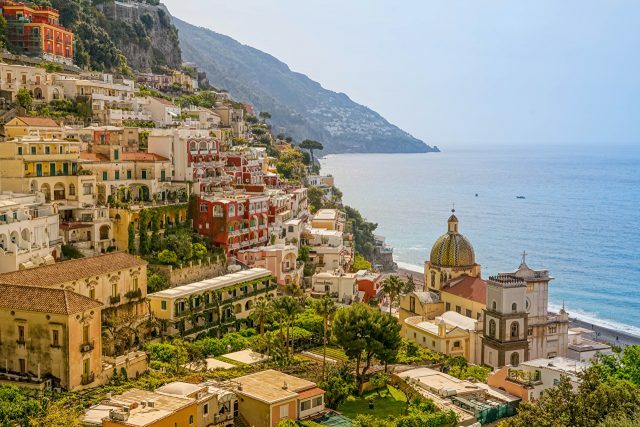 At their choice worth considering, that Italy's hotels for a holiday in Amalfi are in high demand in the autumn and spring. The hotel is located in a former convent 17 century. From the top of the cliff, Where is he located, Sweeping views of the Gulf of Salerno. Monk cells become a luxury hotel with high vaulted, in which a unique combination of medieval architecture and modern decoration elements creates a unique environment comfort. The hotel has all facilities for comfortable stay in Italy. On the vast territory of the lovely garden, There are swimming pool and sauna. The first-rate spa guests are provided with a variety of cosmetic services. It offers spacious apartments near the sea. The rooms overlook the cozy terrace with a snow-white lace fence. The beach is a stone's throw away, Amalfi and the historic center - within walking distance. Beach holiday in sunny Italy, rich in variety of events – excursions, water sports, bright national holidays, It leaves no one indifferent.